Your call history is an important part of your device and how you use it. It's downright genius, how you don't have to go back to your contacts list to see who you've been taking to. But more importantly, it keeps some numbers you haven't had the chance to add to your contact list available albeit for a short period of time. So, accidentally deleting call history on your iPhone running iOS 12/11/10/9/8/7 can potentially be a nightmare situation especially when you hadn't saved a particularly important phone number. If this is what has happened to you, keep calm! We're here to help. We will show you how to get your deleted call history on iPhone back, important phone numbers intact. Is it Possible to Recover Deleted Call History from iPhone? It is actually quite possible to recover deleted call history from an iPhone thanks to the way the device stores data. The iPhone saves data on an SQLite database where the deleted files go. When data is deleted, its status is changed from “Allocated” to “Unallocated” on the database but not completely removed. When new data is added on to the device, it automatically occupies the “Unallocated” section of the data base, thereby overwriting any data in that section. 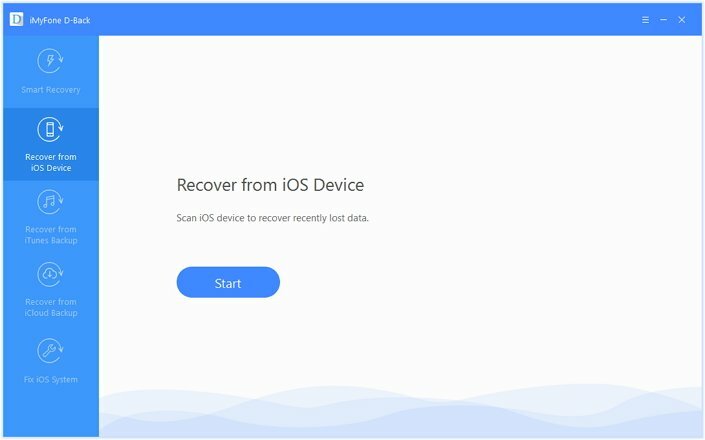 For this reason, as long as you don’t overwrite the data, third-party iPhone data recovery software can access the iOS SQLite database and recover the deleted data. Before we get ahead of ourselves, it may be a good idea to begin by checking your iTunes or iCloud backups. It is possible that the call history may have made it to one of the backup files. If they are there, it is only a matter of restoring. If on the other hand, you don't back up your call history, we recommend that you stop using the iPhone as soon as you can. Because any new data generated on the device may overwrite the missing call history, making it hard to recover. Therefore, if you want to view existing and deleted data in your iTunes and iCloud backup or if you don't have a backup at all, a professional iPhone data recovery tool like iMyFone D-Back is the best choice. You’re able to recover data without the need of a backup which speeds up the entire process for you. You can view all the content of iTunes or iCloud backups so you can select which data you want. The tool does not overwrite current data on your device which means you never have to worry about losing anything else. 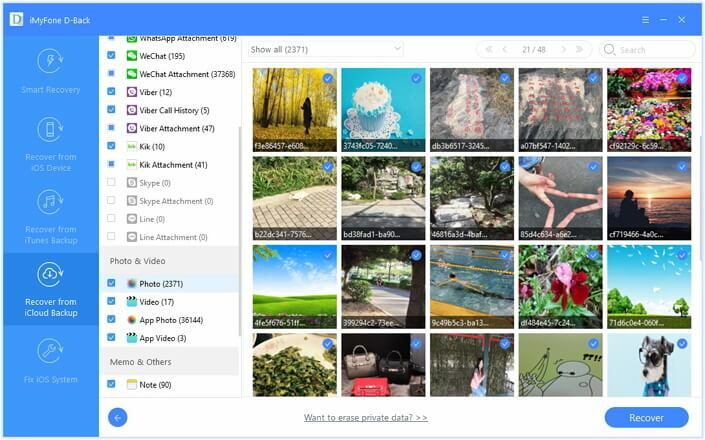 There's no storage limit which means you can retrieve as much data as you want without having to delete anything or pay for additional storage. It is very easy to use. As we shall see very shortly, the program is quick, efficient and very easy to operate. You can use it to recover data regardless of how you lost the data in the first place. You can even recover data from a damaged or broken device or a software operation gone wrong. 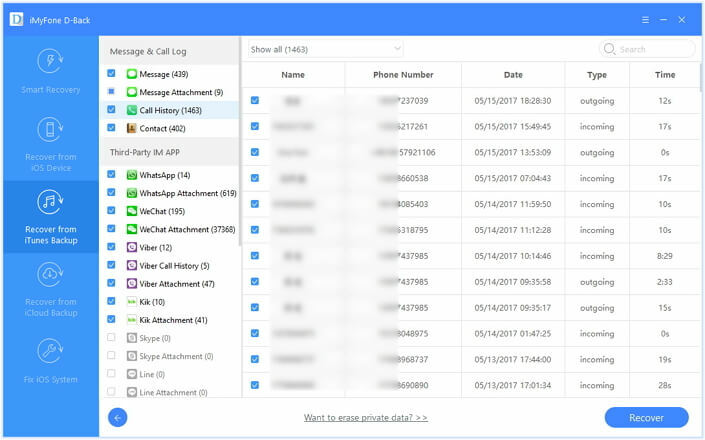 Aside from call history, you can recover more than 18 data types including photos, messages, videos, notes, WhatsApp messages, contacts, safari history, etc. It is compatible with nearly all iOS devices and versions of the iOS operating system including the new iPhone X, iPhone XS, iPhone XS Max, iPhone XR and iOS 12/11. Here's how to use iMyFone D-Back to recover your missing call history. You can use one of three data recovery modes. 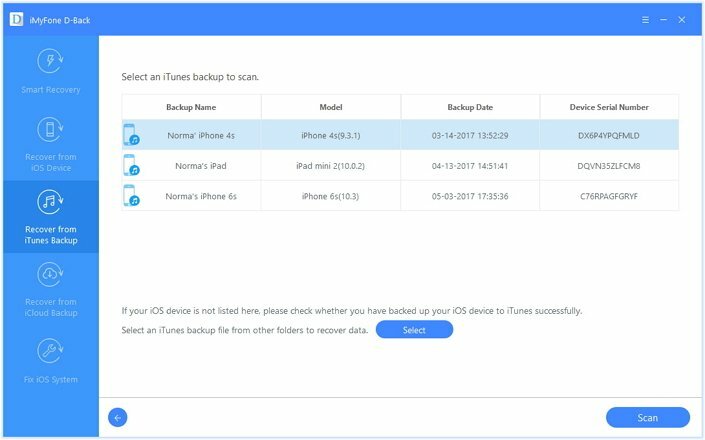 If you had a backup and only want to recover the call history from the backup file, you can use iCloud or iTunes data recovery mode. If you hadn't backed up the call history, you can recover data directly from the iOS device. The following is a step by step guide for all three modes of recovery. Step 1.After downloading and installing the program to your computer, select the "Recover from iOS device" tab from the main window and then click "Start." In the resultant window, select "Call History" under "Message and Call log" and click "Next". Step 2.Connect the iPhone to the computer using USB cables and then click "Scan". Step 3. Once the scanning process is complete, select the missing call history numbers and then click on "Recover". Follow these simple steps to recover the call history from an iTunes backup file. Step 1.From the main menu, select "Recover from iTunes Backup" and then click "Start" to begin. In the next window, choose "Call History" and then click "Next" to continue. Step 2. Choose the iTunes backup file that contains the call history you want to recover and then click "Scan". Step 3. When the scan is complete, select the numbers you want to recover from the results displayed and then click "Recover" to save them on your computer. 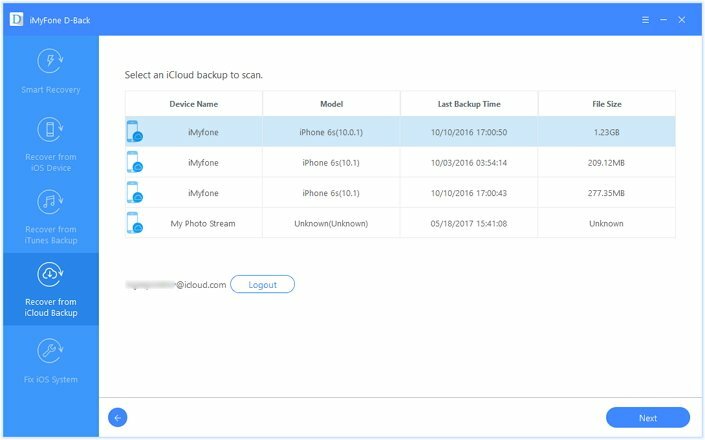 You can also recover data from your iCloud backup in the following simple steps. Step 1. 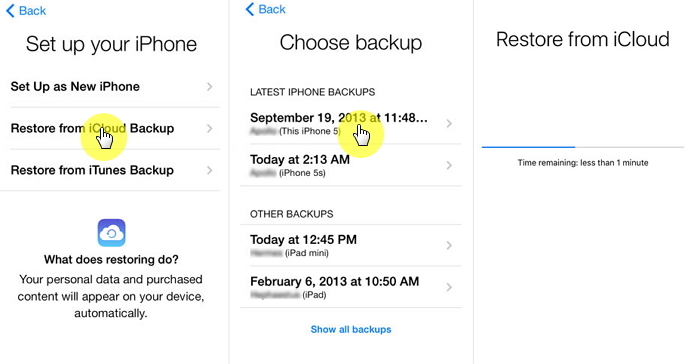 From the main menu, choose "Recover from iCloud Backup" and then click "Start". Choose "Call history" as the type of data you want to recover. Step 2.Sign in to your iCloud account. The program will then display all the iCloud Backup files on your account. Select the one that likely has the missing call history and then click "Next". Step 3.The program will begin scanning the backup file for the call history. Once the scanning process is done, select the missing numbers from the results page and then click "Recover" to save them on your computer. 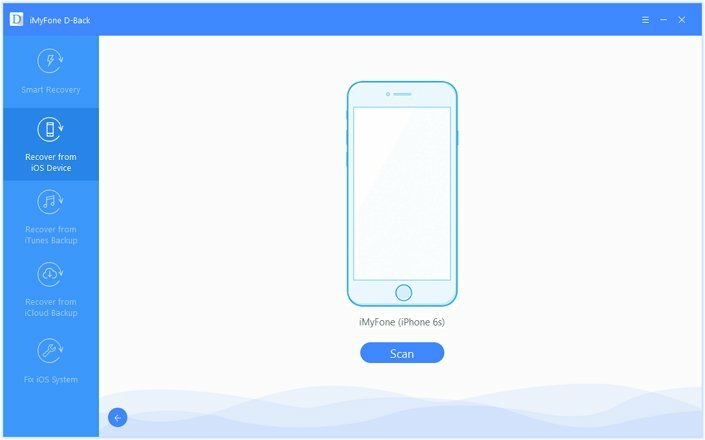 Try iMyFone D-Back iPhone data recovery Win or iPhone data recovery Mac to get back your accidentally deleted call history on iPhone running iOS 12/11/10/9/8/7. If you already have an iTunes backup, you can easily restore your most related iTunes backup to your device. While if you have your device with you and want to restore from an iCloud backup, there is a simple way to check if you have a recent iCloud backup: simply go to Settings > iCloud > Backup and check if “iCloud Backup” is turned on. You should also see the date of your last backup. Don’t click “Backup Now” as doing this will overwrite your backup. After confirm that it is available, you can restore your iCloud backup. Restoring from iTunes or iCloud is free to use. You can also get your call logs back on your phone as long as they are available in the backup file. But you will lose all the data created between when you created the backup and the date you restored the backup. Although using a data recovery program is not free, there is a free trial version of D-Back that allows you to preview the recoverable data. You can use the free trial version to see if the call history can be recovered before purchasing. The software will also allow you to selectively recover data. It doesn't allow you to transfer the recovered data to the iPhone, which is aimed at preventing data overwriting issues on your device. Moreover, data recovery is not always a guarantee. It is quite easy to overwrite the data on your iPhone by simply using the device. Hence, there is no data recovery tool that can guarantee to recover data from your iPhone 100%. So do not hesitate to try the free trial version of D-Back.